For classic “sand-between-your-toes” beach-front accommodation, the Stardust has been a favourite with surfers and discerning budget travellers for years. Facing beautiful Arugam Bay, it offers peace and tranquility while still being handy to shops bars and restaurants. The renowned Arugam Point right hander is within walking distance, and other great breaks are easily reached by tuk-tuk – see Sri Lanka Surf. The Stardust Beach Hotel is set in lush tropical vegetation and shaded by palm trees. All rooms in the main building have a private balcony and an outlook over greenery to the sea. Rooms are simple but comfortably furnished with ceiling fan, mosquito net, single or double bed, and ensuite tiled bathroom with shower, handbasin and toilet. The restaurant sits in the same garden setting and it’s open sided so guests can enjoy the natural surroundings and the cool sea breezes. Stardust serves all meals and snacks with your choice of local and European dishes made with fresh local ingredients. There’s the best selection of wines in the area, as well as cold beer and soft drinks – refreshing fruit lassi is a speciality. As well as surfing and relaxing on the beach, Stardust can arrange transport and day-trips to fascinating local sites. See 1000-year old Mudu Maha Vihara temple ruins at the nearby town of Potuvil, or explore the buddhist shrines and caves at the Kudimbigala Forest Hermitage. Wildlife abounds in forests and lagoons around Arugam Bay. See elephants, peacocks, crocodiles and water buffalo in their natural habitat and spot rare birds at the Kumana Reserve. Colourful fishing boats anchor in the bay, and bring their catch ashore on the beach in the evening – the hotel can even arrange for guests to go out on a fishing trip. Stardust also offers Yoga Classes from May to October, as well as a massage centre specialising in reflexology and sports massage for surfers. 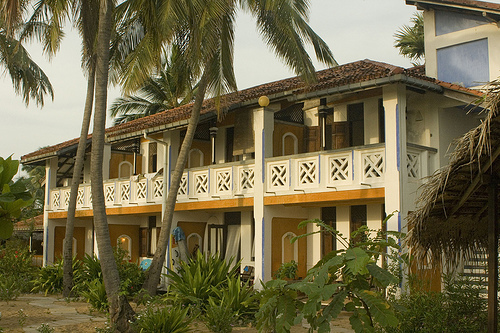 Combine surfing, sightseeing and complete relaxation with a stay at Arugam Bay in the Stardust Beach Hotel. Make it a stopover on a tour of Sri Lanka or spend a whole holiday here, chilling and checking out all the east coast attractions. Atoll Travel can arrange it all, with airfares, airport connections, a Sri Lanka tour and accommodation at Stardust.